It’s a beautiful spring morning, cold and a bit blustery, but sunny, as Maddy and I head off to Clapham Junction. I’m trying to think of April’s Fool jokes to play on her but wonder if she’s old enough yet. I think of the ones my father used to play when I was little. Definitely not suitable yet! She’s on holiday from nursery and Anna and I have planned a series of days out to keep her entertained and occupied over Easter. I’m so glad that Anna’s getting a day off from Maddy-care, not least because she has a demanding job – she’s an academic, too – with a book deadline looming, so she’s getting very tired. Today, my little girl and I are off to the Transport Museum in Covent Garden, an outing recommended by another friend with a three-year-old girl. First stop is the station to meet my old friend Sam who has a daughter, also Anna, a few months younger than Maddy, with whom we’re teaming up for the expedition. Very sadly, the last time I saw them was in December, at the funeral of Sam’s husband and little Anna’s father, Stu, who died of cancer at the tragically young age of 52. Sam and I have been in touch by email since then but because they live in a village near Horsham, and Sam has been busy embarking on a new and challenging phase of her life, this is the first time Maddy and little Anna will have seen each other since August, when we had a lovely day in the country. Stu was obviously seriously ill but nonetheless made sure we had an occasion to remember, including making an amazing lunch. 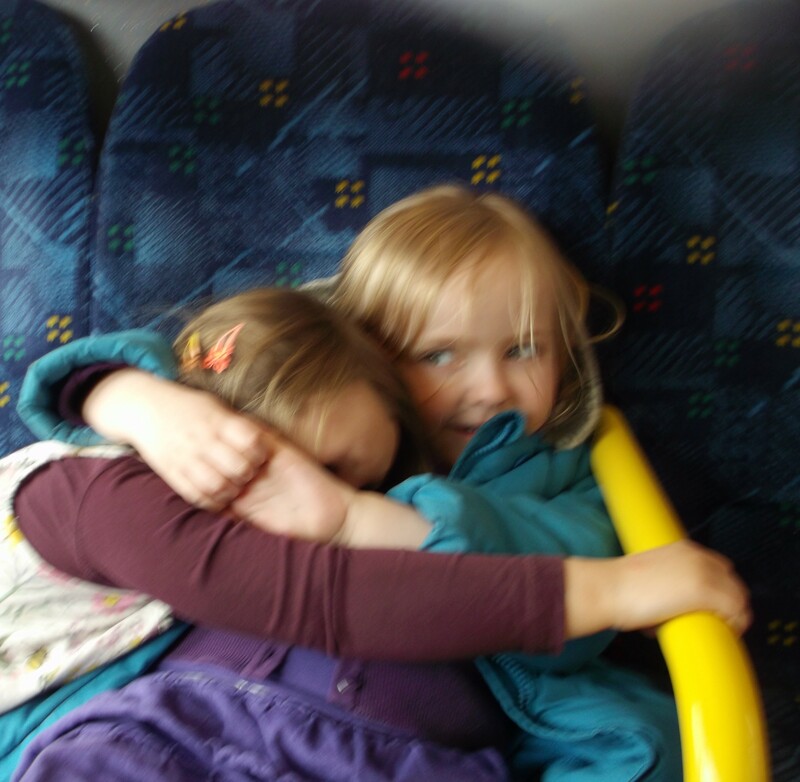 Afterwards there was lots of jumping in muddy puddles (Peppa Pig cognoscenti will understand) en route to the local playground, where the girls did a joint rendition of ‘Let it Go’ (word- if not pitch-perfect) from their favourite Disney film, Frozen. This has now made its way onto Youtube in case anyone wants to track future winners of The Voice. Once we’ve gathered, bought some snacks and checked no-one needs a wee, we head outside the station to catch the 87 bus, which will take us pretty much all the way. We’ve decided on this route so that Anna can see a bit of London, including Big Ben, which she’s become fascinated by because of its prominent role in another Disney favourite, Tinkerbell and The Great Fairy Rescue. She’s also never been on a double-decker bus before, so is delighted to sit in the very front seat at the top alongside Maddy, while the latter provides an impressively reliable commentary on our surroundings. As we approach Parliament Square, for example, she explains to Anna that ‘this is where the government sits;’ and adds, ‘we have to put this government in the bin’ (the things they pick up at nursery!). Little Anna, however, is less interested in the upcoming elections than in Big Ben which soon swings into sight in all its Gothic grandeur, prompting gasps of delight from both girls. No sign of Lizzie, her father or any other characters from The Great Fairy Rescue, unfortunately! They also love the mounted cavalrymen in their shiny breast-plates whom we see later, outside Horse Guards Parade. We get off in Aldwych. I’m impressed that despite being on the bus for the best part of 50 minutes, neither girl has got twitchy. And they seem to be getting on very well. As I’ve had time to catch up with Sam on developments since Christmas, and to be deeply impressed by the amazing positivity and dignity with which she’s adjusting to her unwanted new life, I’m thinking this is going to be a great day out. Walking to the Transport Museum, something odd happens. My mouth fills with saliva and I feel nauseous. It quickly passes, however and, not wanting to disrupt the day, I don’t say anything. After a latte in the museum café, I feel absolutely fine. We indeed have a fantastic day, the girls delighted by all the strange old coaches, train carriages and buses, the chance to get their entrance cards stamped at the ‘ticket machines’ positioned strategically round the galleries – and the dressing-up stations. Maddy can’t resist any chance to dress up. 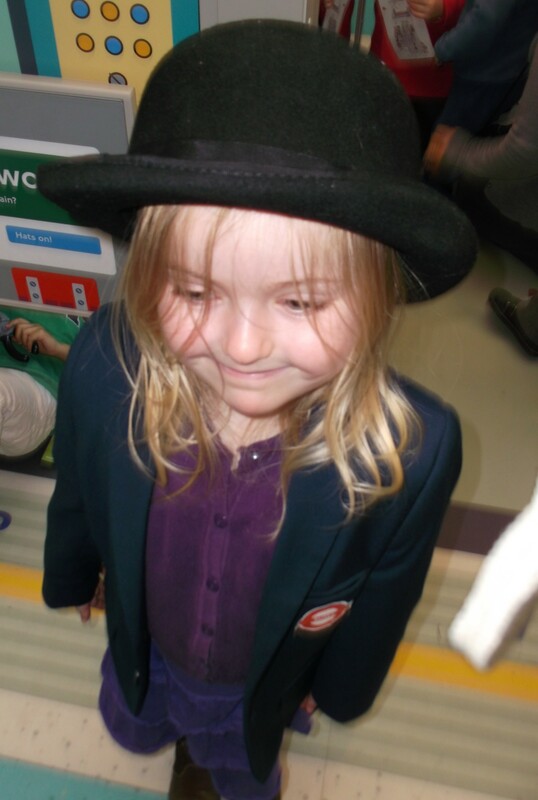 First she puts on a child’s London Transport uniform jacket, then a black bowler hat from the costume cupboard. I suddenly realise I’ve never seen her in black before and with her blonde hair and blue-grey eyes, she looks gorgeous! I have to find her a bowler online! ‘I’m going to school, daddy,’ she first announces proudly, getting into the mock-up tube carriage. Then she comes out and stands by the door. ‘I’m a ticket respector, daddy!’ She proceeds to ‘respect’ the ‘tickets’ of various somewhat bemused children, before moving on to the Transport café dressing-up station, where she’s soon in her apron and white chef’s hat, dishing up to all and sundry. We lunch at Jamie Oliver’s outdoor place in Covent Garden Market (6/10 max for those who might be tempted), where I enviously watch Anna eat up all her salad and greens while Maddy looks on disdainfully. Afterwards, we return for more dressing up etc at the Museum. When it’s time to leave, Maddy needs to use the loo. Accompanying her, I follow suit. I get a sudden aching pain in the right testicle, as if someone has squeezed it violently and let go. The utterly sickening feeling goes as almost as quickly as it came and soon we all set off to catch the bus back to Clapham Junction. It’s so nice to see Anna and Maddy sharing their remaining snacks and holding hands and giving each other affectionate hugs. The day out has worked as well for the kids as it has for the adults. 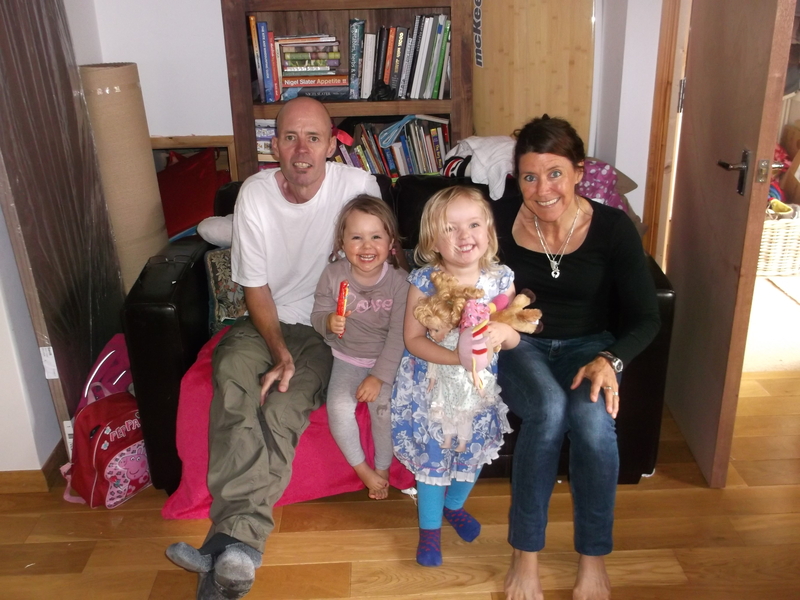 Shortly before Clapham Junction, Maddy and I get out, leaving little Anna and Sam to continue their journey to the station and catch the train back to Horsham. As I semi-jump down from the bus to the pavement after Maddy, I get a violent stabbing pain in the kidney area. It takes my breath away and again I have the feeling that I want to vomit. But I don’t want to alarm Maddy so, after a short pause to catch my breath, we resume the walk to our Anna’s flat. Let me explain. Although we’re a single family unit, we have two flats. This is because I recently sold a large house which I bought many years ago in France and was keen to do something useful with the proceeds. Haunted by the fact that so many young people today remain at the mercy of more or less scrupulous landlords well into their thirties, and even forties, I thought that we could invest the money in a small place so that Maddy would have a starter home when she was older. Otherwise, if circumstances changed, the money would at least have kept its value, allowing us to be able to sell both flats and buy a family-suitable house. With the help of a massive new mortgage, funded by Anna, the five-bedroom early nineteenth-century French stone house with enormous garden in the Pyrenees transmogrified into a modest but pleasant flat in an unprepossessing block a few minutes walk from our original place, which is now known as ‘daddy’s flat.’ From our point of view, the real coup was that the new flat was in the catchment area for two very good primary schools – far better than those close to where we were based before. Since buying last July, we’ve been spread somewhat awkwardly across the two properties, while we wait for news of school placements for Maddy before deciding on longer-term housing. As we walk down Queenstown Road towards the flat, my mate Paddy the framer comes out of his shop. I don’t want to linger but it’s impossible to resist his broad Irish smile. She keeps repeating the doggerel rhyme all the way back to Anna’s. Her three-year old’s sense of the hilarious is a useful distraction. On arriving at Anna’s, she makes me a cup of tea and we exchange the news of the day. Not wanting to discuss it in front of Maddy, I defer mentioning the pain. However, I quickly notice that I can’t get comfortable on my armchair, so after a few minutes, I lie down flat on the rug on the living-room floor. Big mistake. When I try to get up again to go to the loo, I have the second most excruciating pain I’ve ever experienced (on what topped it, see the next entry below.) I manage to get away from Maddy and into the loo, where I kneel down and retched repeatedly, every few seconds, for about two minutes, without bringing anything up. Because of the frequency of the spasms, I can barely breathe, let alone call Anna, so it’s a while before she comes to investigate why I’m taking so long. She finds me in a miserable state and does her best to comfort me, despite being in obvious shock herself. However, within a few minutes, the pain passes as mysteriously as it came and I’m able to stand up. By a complete miracle, I’d made a doctor’s appointment at my local surgery for the early evening to follow up a previous problem (see also below). I manage to get a bus there and after some delay get in to see him. He examines my abdomen, testicles and kidney area and pronounces that I have a testicular torsion. Since this is potentially very serious, he advises me to head straight to A and E at Chelsea and Westminster, across the Thames from Clapham Junction. On arriving at A and E, I hand in the letter from my doctor and am seen pretty quickly by an assessment nurse, to whom I deliver the urine sample taken by my GP and we discuss my symptoms. He soon tells me to take a seat outside. The moment I sit down again in the waiting room, I break into a cold sweat – perhaps because my kidney’s resting against the back of the metal bench. Leaning forward provides some relief but every so often a wave of pain passes arrives, not as intense as in the afternoon, but again making me want to vomit. Keeping Anna updated at regular intervals, I drink as much water as I can, though I dread going to the loo again after the museum experience. Eventually, after a two-hour wait, I’m seen by a young urology doctor who describes himself as a ‘loin to groin’ specialist and is compassionate, reassuring and friendly. After a careful examination, he rules out testicular torsion and focuses on kidney stones, which he seems pretty confident is the problem and which he says inflicts the worst human pain short of childbirth without anaesthetic. Still, he insists, these days they’re pretty easy to treat. He explains that it’s too late to do a CT scan to be 100% sure and that I should return in the morning to have one. Leaving the examining room, I go to the lavatory. My urine’s darkened considerably; to my horror two small, semi-solid objects also pass through while I’m weeing. I call the urology doctor who’s at a loss, no doubt because it’s difficult to see much through the bloody mixture and he understandably doesn’t want to have to fish them out. He eventually ventures that they might be kidney stones which have already passed through my system and been broken down in the bladder before being expelled. Exhausted, but somewhat reassured, and reasonably comfortable again, I leave the hospital and gingerly set off for home. Anna being with Maddy, and it being nearly ten now, I don’t want to ask her to get someone in to look after our little girl for the night so that she can come to mine; nor did I want to go there in case of a recurrence of the attacks and potentially serious disruption / upset for her and Maddy. So, mine being closer and simply desperate now for rest, I decline her repeated entreaties to come over and we agree to review the situation the following morning. ‘And so,’ as Pepys, a great sufferer from kidney stones, habitually wrote – ‘to bed.’ Reassured by the doctor’s assertion that the problem can be sorted pretty easily, I spare a thought for poor Michel de Montaigne. When he had stones, his ‘physician’ forced a long wire padded with waxed cloth right up his urethra in order to try to fish them out. I wonder if it was all the suffering this involved which gave him the ‘right kidney’ to become one of the greatest writers of the Renaissance… But I fall asleep thinking not of Montaigne and Pepys, but my lovely women-folk, whom I hope I haven’t alarmed too much. I’m going to read some of this at the occasional writers’ group I attend tomorrow in Sydney. Another old friend rang me on April 1 to tell me he has leukaemia. My watch weirdly stopped for the 20 minutes he spoke to me. Thoughts and prayers from Australia, mate.